"Cango Wildlife Ranch recently received a call from a local farmer requesting some much needed assistance. 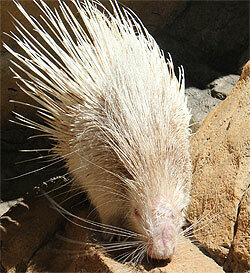 On arrival at the farm, Cango's curators were shocked by the scene… a white female albino porcupine! Unfortunately, most of the curators shock lay in the severe facial injury that the porcupine had obtained, presumably from a large live-trap. After a slight struggle from the terrified animal, the curators managed to capture it and take it to the ranch for examination. Most of the porcupines face had been skinned, with a large section of the skull visible. The section of skull visible, was approximately 4cm by 6cm large allowing you to see multiple hair-line fractures in the bone. It was unknown as to how long… or even if the injury would ever fully heal. Being an Albino porcupine, she has white quills, pink skin and red eyes, all due to a recessive gene caused by lack of pigmentation called Melanin… making her very rare! After months of around-the-clock care and medical treatment, Penny, as her loving curators have fondly named her, has made a remarkable recovery and now has nothing but a faint scar reminiscent of her injury. Penny now resides on the ranch with her new love Prickles. Prickles is a young male who was also rescued from a farm after being found (just a few days old) next to the body of his mother, who had been shot. 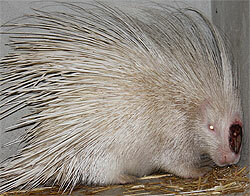 Porcupines are unfortunately considered vermin by farmers as they can easily destroy crops in search for food. Penny and Prickles were introduced to one another just days ago. Their initial 'flight or fight' reaction quickly faded and resulted in love at second sight! 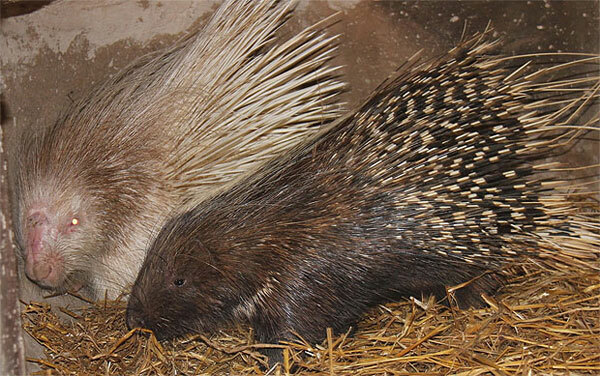 Both porcupines have reached sexual maturity, meaning that the ranch may welcome prickly babies in the very near future! With the help of Cango Wildlife Ranch, both Penny and Prickles were given a second chance at life… and now love! An undeniable 'white' Christmas miracle!" CJ Langenhoven (1873-1932), father of Afrikaans, was born and died in the Little Karoo.